Who is this handsome man you ask? Well, that’s my husband and officiant for hire, Matt Arrufat; football coach and teacher by day, officiant by night. He got his start in public speaking as a groomsmen in multiple weddings. He’s basically the guy version of 27 Dresses. Each one of those tuxes called for a different speech on a different night about a very special friend and he nailed every one of them. He’s eloquent, funny, sentimental, thoughtful, and gives your ceremony the respect and love it deserves. His years of teaching and coaching at Geneva, a small private school in Boerne really gave him a voice. He is an amazing public speaker and can appeal to any audience. Wrangling high school kids, locker room pep talks, running pep rallies and leading devotions has given him a knack for public speaking and running a ceremony. 60 hours a week of strategizing a game plan every week has made him a mastermind for planning a wedding. I always tell him, think of those x’s and o’s as hugs and kisses! With Country Sugar Events, he has had to jump in on numerous occasions to help me out. I worked all the way through both of my pregnancies and resumed work shortly after each baby was born. The only way I was able to do it was because of Matt. He became my right hand man and really learned the ins and outs of weddings. He has been attacked by bees in the middle of a field while sending the bridal party down the aisle, he’s thrown his back out lifting giant urns filled with floral arrangements, he scared off a bunch of German tourists trying to do a wine tasting right before a ceremony began, he was carried down a hill by flood waters during a monsoon, and he organized the Plan B bride and groom send off during a tornado warning, just to name a few. Each one of these crazy scenarios, he handled with poise and composure. He has a way of organizing a crowd and getting them to listen to everything he has to say. Many clients have said, they don’t know what I would have done without him. We finally decided it was time for him to start officiating on and off the field so he got ordained. Those bachelor parties don’t pay for themselves! Hey Lovebirds! My name is Bradley O’Neill and I would love to officiate your wedding! I got my start by being a groomsmen in many of my friend’s weddings. 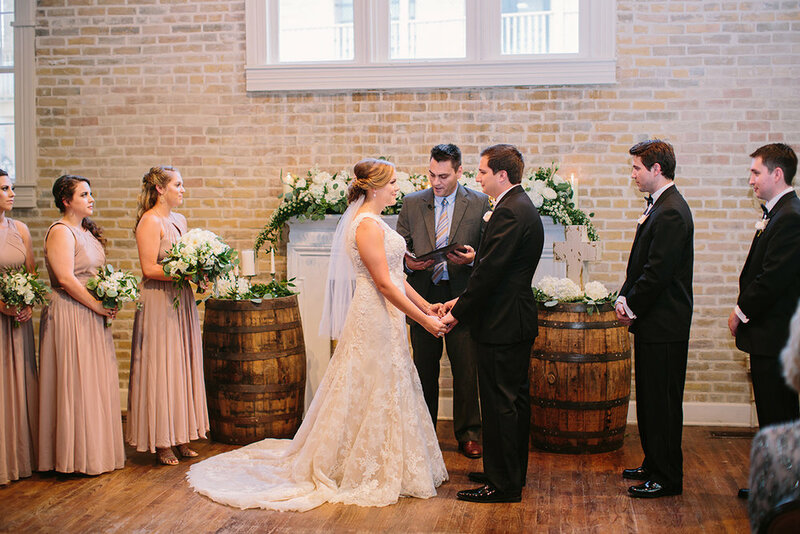 One best man speech, led to another, led to officiating. One of my good friends asked me to officiant his wedding so I gave it a shot. Everyone LOVED the ceremony and they were married at the end so all in all, a positive experience! Since then Natalie brought me on with Country Sugar Events and Queen of Harts. I have known Natalie and Matt for years so we all work together to create amazing weddings for our clients. Fun facts about me... I grew up in El Paso and moved to San Antonio after college. I graduated from Texas A&M and currently work as a manager for Pet's Barn while I work on my MBA at UTSA. I am obviously a dog lover and dad to Smush, my English Bulldog. I worked for the Aggie football team in college and got to attend several amazing bowl games. I am super tall so you will be able to speak into my lapel mic with no problem ;) I can be bribed with Gummy Bears and I have a great manners, and a great sense of humor. I am passionate about working out but I also love good food so if you invite me to the rehearsal dinner or reception, I will bring my appetite! My goal is that your ceremony is all about you! It's shouldn't be canned or stale or run of the mill. I want it to be memorable, meaningful, and special. I want you to be a part of creating it so it resonates with you and your family for the rest of your life. So many people focus on the reception but the most important part of the day is the ceremony!